No, it's not the 1st Sunday of the month. Did you miss me?! I was one of many applauding the welcome of our new Reds - Jenn & Ingrid. Welcome! I have enjoyed getting to know a little more about you both this week. And, I've been reading Will Schwalbe's "Books for Living." As readers, I think it's a book you'll enjoy and it's one I recommend. Mine was a gift from a friend who knows me well, and while reading it I couldn't resist the urge to order one for a another friend. It's that kind of book. One you're going to want to share. Naturally, while reading Mr. Schwalbe's book, I found myself remembering particular books that brought something into my own life. Touched me in some way. Books that may pop randomly to mind for, seemingly, no particular reason, or clearly tied to a singular event. I think probably all readers experience this, don't we? Fall in love with a book and immediately want to share it with like-minded friends? In no particular order, I'm going to share some of those that have meant enough to me, for whatever reason, that they've earned their own little corner in our house. A little corner of extra copies of books that I love sharing with people I think will enjoy them. One of my favorite books is one I resisted reading for a long time. The title "The Guernsey Literary and Potato Peel Pie Society" was, for some reason, off-putting. That, along with all the hype bothered me. It just didn't sound like my cup of tea. I was so wrong. And it's one of those books filled with passages you want to read aloud. Either to whomever is close by, or just to hear them yourself. Isn't that wonderful? And true, I think. Speaking of passages you want to read aloud - a whole series of books that I feel this way about is Louise Penny's Three Pines series. I am constantly following Donald around the house saying, "Oh, listen. Listen to this!" Usually when I do this he knows it's going to be something by Louise, or by Pat Conroy. Pat Conroy wrote books that beg to be read aloud, I think. One of the first books I fell in love with as a teen was Herman Wouk's "Marjorie Morningstar." Another book that lives in the corner of "to be shared" books is Anton Myrer's "The Last Convertible." And Michael Malone's "Handling Sin." James Anderson's "The Never-Open Desert Diner." Anne Rivers Siddons "Peachtree Road." Every word written by Margaret Maron. 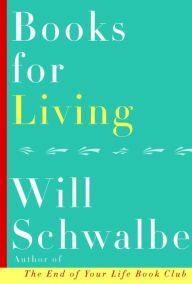 And in remembering that I'm only writing a blog here, NOT a sequel to Will Schwalbe's "Books for Living," I'll stop with my list. That's certainly not to say that's the end of my list. Pfft. Far from it. But - it's a good start. All of these books have been, still are, important to me. Are they "important" in a larger sense? Important in a way of being BIG IMPORTANT BOOKS?! Not for me to say - some on this list are simply books I love. And that's important enough for me. In "Books for Living," Mr. Schwalbe talks about books that people say have saved their lives. In some cases, this is quite literally the truth. As in Theodore Roosevelt's case when he was shot while on the campaign trail in 1912. His speech, in manuscript form, was in his overcoat pocket (along with his metal eyeglass case, which I'm thinking may have also helped). The bullet still found it's target, Roosevelt was indeed shot, but he insisted he was not injured badly enough to not give his speech. There are less dramatic instances of life saving books, of course. Or, perhaps it's a book that while not life saving is, in some way, life changing. Quoting Will Schwalbe - "A book doesn't need to be thick enough to stop bullets . . . It just needs to be the book you need when you need it." Another Schwalbe quote brought a particular book to mind. It's a book of particular importance to me. First, the quote: " . . . reading should spur further engagement. When you read about injustice, you need to do something about it. Books have played a role in almost every one of the world's great civil and human rights movements, but only because people who read them decided to act. Reading brings with it responsibility." The book that has lived in my mind for a very long time (and one I still actively seek out in used book stores. 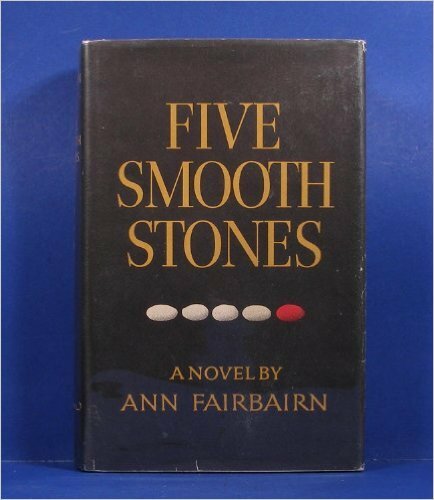 I can't even remember how many copies I own) is Anne Fairbairn's "Five Smooth Stones." Anyone who has read it will understand why. It's not an easy book to read - even now. I read it the first time when it was first published in 1966. Sadly, it's still, in many ways, a timely novel. And one that has gone out of print more than once, only to be brought back. In 1966, I was a senior in high school and my hometown was in the news for all the wrong reasons. Cambridge, MD was one of the first towns young black Freedom Riders visited. We were placed under Martial Law. National Guardsmen lived in tents on our school grounds. They stood on street corners with guns and bayonets. This period of my life molded and forged me to be the woman I am now. "Five Smooth Stones" was a huge part of that molding and forging. That shameful period affected and molded many of my classmates completely differently. While I am certainly not the only non-conservative, there are not a lot of liberals from the Cambridge, MD Class of '66. So, yes, I understood what Will Schwalbe was writing about, and it resonated loudly. Books entertain us, but oh my - they do so, so much more. Dear Reds, What book or books do you hold dear, that may have even changed you in some manner? Oh, goodness, books I hold dear? Judging from the number of books that I simply cannot bear to part with, the list is endless . . . . While I can’t say with absolute certainty, I believe every book read changes readers in some way. Harper Lee’s “To Kill a Mockingbird” . . . Isaac Asimov’s Foundation books . . . my old copy [before the recipes were “modernized” for diet, lifestyle, and health] of “The Joy of Cooking” . . . Isaac Asimov’s “The Best New Thing” . . . .
Joan, I have four editions of The Joy of Cooking! Kaye, you've mentioned The Never Open Desert Diner before, and I'd forgotten to buy it. No longer. I'm going to start reading it now. Thank you. Mark Twain's Innocents Abroad is at the top of my books for living. It follows a traveling group of Americans on a round the world tour. Twain is along to send reports back to his newspaper on what they see. He humorously skewers the arrogance of the travelers, who foolishly believe they are superior to everyone else they encounter, and who seem to misunderstand nearly everything they see. It's brilliant satire. So interesting... I think a question like this is a bit of a Rorschach. One of mine would be THE STONE DIARIES by Carol Shields. One that demonstrated you could be an average woman and have something significant to write about. What an excellent post! I rarely make it to Jungle Reds on Sundays, and I'm so glad I did today. Books I hold dear include the whole Louise Penny Three Pines series, as well. And a science-fiction trilogy called The Chronicles of Thomas Covenant, Unbeliever, by Stephen R. Donaldson. Margaret Maron's Deborah Knott series, for sure, and The Chronicles of Narnia by C.S. Lewis... I could go on, but I'd better stop there. As for a book that changed my life, I'd have to go with The Women's Room by Marilyn French. Not one people talk about much any more, but I was a college student when I read it and it shook me to my core. Not all parts of it equally, but the part about what it was like to live in an unfulfilling marriage as a homemaker seemed quite revolutionary to me at the time and became a touchpoint for several major decisions in my life. The woman's Room is one of 2 books that I say shaped me (the other is Vera Britsin's Testament of Youth), I too read it as a young woman, just graduating from university, still have my copy! Kay, you got it exactly right--the book you need to read right now. After a long, slow illness, my mom died quite unexpectedly a week before Christmas--which was her birthday. Less than two months' later, we buried my dad beside her. I couldn't--we couldn't--process/accept/move on--like sensible adults should be able to do, right? I wandered the stacks of my local library, looking for what, I don't know--escape, distraction? One day, I reached out and my hand pulled off the shelf The Orphaned Adult by Alexander Levy. That book literally saved my sanity. And to this day, I cannot find that book in the library. I suspect it spoke strongly to someone else, who perhaps forgot to return it. Other books? Way too many to list here. Zen and the Art of Motorcycle Maintenance. More recent ones? It's amazing how many mysteries speak to me--perhaps because they involve loss of life--and the best writers don't treat that lightly--it affects their characters and I appreciate that--the human relationships, the ways to embrace and appreciate life in the face of loss--so a big shout-out to our wonderful Reds! Deb's DREAMING OF THE BONES amazes me every time I read it. OUR LADY OF THE LOST AND FOUND, Diane Schoemperlen, magnificent book. FINAL GIFTS by Maggie Callhan and Patricia Kelly, hospice nurses, the only book you'll ever need to read about death and dying. If you are still reading, congratulations. This is my short list. The long one would go on for days. I read the back of cereal boxes too. And Kate, we were talking about the Guernsey book just a couple of weeks ago, loved it. The movie is due to be released in 2018, should be a treat. And WHERE were you last Sunday? No excuse. The Guernsey Potato Peel would definitely be on my list too. Oh, we asked Kaye to let us introduce the new Reds last Sunday! So let's see-what a fun topic! Joan and Karen - Oh my goodness, The Joy of Cooking! I'm one who will sometimes take out a cookbook to read as a novel, and that one is in that group of books. Hallie - I have not read The Stone Diaries. How do I not even know about The Stone Diaries? Adding it to my list! Susan, Margaret Maron's books are on on a shelf in our bedroom. This is the place I keep the most special books and I am ashamed of myself for not including them. She's a woman I hold dear in my heart, and her Deborah Knott is the reason I can call Margaret a friend today. The Women's Room. wow. It's been a long time since I thought of that book. But, yes. I remember the feelings I had while reading it. That it was an important book - and it was. And is, I think. Oooh, Roberta, what a terrific list. Rebecca, of course! THE STORIED LIFE OF AJ FIKRY - I love that book! FChurch. No words. But because I've been fighting some depression recently, I'm going to look for The Orphaned Adult. Thank you. Ann, my "another nasty woman" friend! I love your list. Sarum! Oh my - I felt like I had stumbled onto the most amazing book ever when I first read Sarum. I adore his other books, but none as much as Sarum. Donna Tartt - Yes! The Thirteenth Tale (now I want to re-read it). And - I just started Zadie Smith's "On Beauty" last night. Rhys, Love your list. Kate Morton is another author I adore. Narnia - oh, my. And The Wind in the Willows - yes! Talking about books on a Sunday morning. What could be more perfect? I must stop here or I'll never get anything else done - - - Did I mention MM Kaye? Yes, I also love to read cookbooks, but not exactly like novels. Maybe as short stories, especially Joy, which has had three different authors over the years, all of whom lived within five miles of our home. Ethan Becker, last I knew, still lived in our community. The stories in some of the editions are really deeply personal, although they're scattered throughout all the volumes, and they are so telling about the way life was lived at that moment in our shared history. One of the most life-changing books I've read was Wayne Dyer's late 70's book Your Erroneous Zones. At the end of it I closed the book and realized it could be summed up in one sentence: You are in control of your own life, and only you. In my late 20's that was most definitely a message I needed to hear and it truly torqued my attitude towards every single thing from then on. SEE! Start a list and it grows and grows and grows and you just have to stop it. Otherwise, the list could easily become a book, couldn't it?! I did go back to my post and add Margaret Maron's name. I had to. There are few women in my life as important to me as Margaret. I "could" have sneaked in a few more books while I was there . . . but, I didn't. Hank - While reading your list, Hallie's statement about this being "a bit of a Rorschach" popped into mind. All the President's Men. That book clearly needs to be on your list. And, I want to thank you for introducing me to Mark Helprin's Winters Tale, which I adore. Jenn - Watership Down! Yes. Oh, my. And now I have this delightful image in my mind of you hugging your bookcases! Kait, I love your list. I pick up The Secret Garden to reread ever so often and it never fails to charm. Here's my list, although I'm sure as soon as I hit "publish," I'll think of more! Oh, Ingrid - Imagining Argentina. It broke my heart. Early Elizabeth George - YES! And I have loved seeing Nancy Drew on so many lists. Like others in no apparent order. and all the wonderful Reds works .... keep them coming please. I have read so many books in my life that it's hard to focus on just one that changed my life. Zilpha Keatley Snyder's A Season of Ponies gave me the notion that magical things could play out in everyday life. Lloyd Alexander's Chronicles of Prydain gave me adventures to grow up with, much the way a later generation grew up with Harry Potter. An adult novel that I discovered early, and have re-read with great satisfaction many times since, is Rafael Sabatini's Captain Blood. Not that I grew up to be a pirate. I could make myself sound all lofty and literary by claiming to have read nearly all of Shakespeare, but let's be honest. I was a theatre major who loved language. Reading all those wonderful plays and sonnets was pure, self-indulgent delight. I wallowed in those words until I even got the jokes without the footnotes. Of course, I love it when family and friends get so caught up with a book that they urge me to read it, too. My mother introduced me to Nancy Drew. My sister urged me to read Mary Stewart. Debs is constantly lending me books from her vast library that she knows I'll enjoy, including books by Jim Butcher and Charles Todd. But it wasn't until recently that I have begun to buy copies of books I love and give them to friends, urging them to read these excellent stories, too. Maybe the first book I did that with was Helen Simonson's Major Pettigrew's Last Stand. I think I bought three or four copies of that one. It was just so delicious. If you haven't read it, treat yourself. Coralee, what a terrific list with some delightful titles. I am a huge Alice in Wonderland fan, and have a copy of the annotated version that a former boss gave me many years ago. It's still cherished. And I have a Pop-Up version I love. Stuart Little! I love Stuart Little to the moon and back. Gigi - buying copies of books to give away. Isn't that the best?! And I think your choice is spot on - I love Major Pettigrew. Lucy - Our Bodies, Ourselves should be required reading for every woman -- and man! I read it in college in 1989 and it rocked my world. Thanks for the reminder. And - how did I not list anything by Jane Austen or Georgette Heyer? Major oversight! And yes, our bodies our selves, brilliant and necessary. How many times did I consult that in college!? And just recently, Alan Bradley's The Sweetness at the Bottom of the Pie. Now I have to quit or I would go on all day. I love that some of our books overlap, and I LOVE that there are many of everyone's favorites that I haven't read, which means more potential favorites in store for me! Oh, and I do love buying books that I love to share with friends! I am so loving this discussion. And yes, Debs, I'm furiously adding titles to my list of books to read. How have I missed some of these titles? And I'm remembering some books that I could easily have added to my list! Laurie Colwin! Oh my. Gaudy Night!!!! I love Gaudy Night. And two novels that I stumbled upon but have stayed with me. The Given World: A Novel by Marian Palaia and In Wilderness: A Novel by Diane Thomas. Both are quite powerful (a word I try not to use 'cause it's so over-used, I think). Maybe I should put a book about editing on my list. That last sentence should end with "which eventually led me to the Reds." Hello, fantastic Kaye! It's always so hard for me to put forth a list of important books/favorite books because finding a stopping point is hard. However, I will give it a go. And, I really have to have a list only for mystery/crime because the authors and their books have made such an impact on my reading and my life. Discovering these authors has enriched my life immeasurably. So, the following authors have and continue to be important: Deborah Crombie, Julia Spencer-Fleming, Hank Phillippi Ryan, Rhys Bowen, Hallie Ephron, Lucy Burdette, Elly Griffiths, Anne Cleeland, Louise Penny, Catriona McPherson, Laurie R. King, Lyndsay Faye, Peter May, Sharon (S.J.) Bolton, Val McDermid, Karin Salvalaggio, Alan Bradley, James Ziskin, Tess Gerritsen, Susan Elia MacNeal, Terry Shames, Charles Todd, Kristi Belcamino, Edith Maxwell, and more and more and more. I know I've left off names, and I will try to add later today. So many of these books would also be on my ever-expanding list! If you've never read The Guernsey Literary and Potato Peel Pie Society, today's Book Bub has it for $1.99 on Amazon, B&N/Nook, and Google in e-formats. ChrisR - This: "There was a series of biographies written for children at my public library, all bound with orange covers with black lettering on the spine -- I read every one about a woman when I was in third grade." I love this! I remember those books. Kathy - I have been waiting for your list(s). I knew I would love it/them! There are many I am not familiar with, but will look into. Harry Potter. HOW could I have left Harry Potter off my list?! Finding a place to stop - yes! Perfectly said. It's dang near impossible once you get started. Karen, thanks for the heads up. I hope everyone who has not read The Guernsey Literary and Potato Peel Pie Society will take advantage of this great price! Well, of course, I've already started thinking of ones I left off. I should have included The Guernsey Literary and Potato Peel Pie Society and I Let Go by Clare Mackintosh. And, Sue Grafton, how did I leave her off? I've read the Guernsey Literary Society but must have given away my copy, so just bought the Kindle AND the Audible narration! How could I have left off the Harry Potter books??? Or Connie Willis!!! And the Sally Lockhart books by Phillip Pullman which are just brilliant. Oh my. I just added a couple of dozen books to my wish list. Kaye, I don't think I ever saw anyone else mention Handling Sin, which is one of the funniest books I've ever read. And I'm glad to see The Winter's Tale on several lists; I love both that and his Freddy and Fredericka. Jim - I love Handling Sin SO much! Glad to meet another fan. The Mists of Avalon - oh, my. YES! Oh, my gosh! "Five Smooth Stones" is one of my favorite books....I have often recommended it (although they are on their own finding a copy...mine will NOT be loaned out) and I thought I was the only person on earth left who knew about it. Also in high standing are "Watership Down", "The Glass Castle", "The Guernsey Literary and Potato Peel Pie Society", "Gone With the Wind" (surpasses the film in so many ways), "The Stand", "The Yellow-Lighted Bookshop" by Lewis Buzbee - if you love books and have ever worked in the book industry, though not necessary...you will love this memoir. A child's book that has fond memories because it was a favorite to have read to him - my son, is "The Grumpus Under the Rug" by Ellen Jackson. So happy to meet another Five Smooth Stones fan. It's a book that I hold SO dear and it truly does live in my heart. When I found a copy with the dust jacket that has a photo of Ann Fairbairn you would have thought I had found The Holy Grail. Very rare. How could I have left off the Lord of the Rings trilogy....and more importantly, "The Hobbit" which , in my opinion, is essential to read before the trilogy. Or, "Possession", or "Sarum", or "A Wrinkle in Time"? Books that shaped me? Everything, everything I've ever cared enough to read. I could list all kinds of books I've read. Instead, Kaye, I'll just mention a few that have stayed with me. A children's book - SNOW TREASURE by Marie McSwigan, a story that was published originally in 1942 about Norwegian children who smuggled gold out from underneath the noses of the Nazis in WWII. That book was a favorite of three generations of my family, beginning with my mother. A chapter in a book, and I can't put my fingers on it right now to tell you the name of it. But, Irving Stone sent it to me when I wrote to him about how much I loved his books, and how much I cried over The President's Lady about Rachel Jackson. He signed it, wrote a beautiful note. It's about his years in college when he spent more time in the college library reading widely than he did in class. It was one more note to read widely. A THREAD OF BLUE DENIM by Patricia Leimbach. An out-of-print book of essays by a woman whose writing always takes me home. She was a farm wife from northern Ohio, well-known nationally in farm circles as a writer. Her essays made me cry. I used them for Readers' Theatre in the library. And, she wrote one essay about a girl's love of books that is still one of the most beautiful pieces I ever read. Her essays are part of my heart. As an adult, I fell in love with the illustrations by Kathy Jakobsen in Reeve Lindbergh's picture book, JOHNNY APPLESEED. My mother made me a wall hanging based on those illustrations. They speak to me. There are authors I love for their use of language - Louise Penny, Rick Bragg. Their writing is pure poetry. They're storytellers, and I love their wisdom and their words about life. But, there's no one particular book of theirs. Isn't it wonderful that books move us so? Thank you for asking. Charlie - Impossible to stop once you get started on this list - for real! Janice - I love that you still have your original copy from your college days. That is proof of a much loved book. Lesa - A book from Irving Stone! omg girl! I am not familiar with Patricia Leimbach but would now very much like to read her essay about a girl's love of books. Rick Bragg - oh my, yes! Kaye, I'm so happy to see The Last Convertible on your list. I LOVED that book so much. Those character truly came to life for me. Ramona, I recently sent that book to a good friend. Reading comments about other books gave me new books to look for. Which books are for keeps? I have a Goodreads Profile and it lists so many books that I love. There are many, many, many books that I love and I cannot recall all of them! Yes, Kaye, Neil Gaiman! And, Debs, I'm so happy that you think the Sally Lockhart mysteries are brilliant, as I do, too. Also happy that you, Debs, and you, Rhys, are Connie Willis fans. Charlie, I should have listed The Yellow-Lighted Bookshop in my original list. It's a wonderful book for book lovers and got me through a horrible ice storm one year. Pat Conroy's My Reading Life is another amazing book about reading, in this case how it formed Pat Conroy, something worth reading about. Kaye, it looks like I need to check out Five Smooth Stones. Oh, and, Rhys, I've been meaning to read The Eight for years and years. And, I failed to mention Dr. Zhivago by Boris Pasternak. I read Doctor Zhivago in my teens and remember being surprised at the differences between the movie and the book. Stranger in a strange land! Yes Debs, I think of it every day! I've read many of the books above and now have many more to read! But no one has mentioned my own personal childhood life-changing book - A Girl of the Limberlost by Gene Stratton Wilder, written in 1909. Anyone else ever read it? And so many more . . .
oh, my gosh - this has been so much fun. Thanks, everyone!!! Anonymous, how could I forget A Girl of the Limberlost and Freckles, both by Gene Stratton-Porter. You're bringing up a whole new crop of older books that made an impact on me growing up. Beautiful Joe by Marshall Saunders is another. Kaye, you gave me such much enjoyment by posting this subject today. Thanks! We are, for sure, a group that loves books! Every single thing about them. Not the least of which is talking about them. I love that. All day I've been trying to decide what books I would list. There are just so many, and I was overwhelmed at the thought of listing them all! I finally decided that I'd never have enough time to list all the important books in my life, Reading has shaped my life; that's for certain. When I was in fifth grade I read books from my grandmother's bookshelves, which I suspect belonged to my mother and her sisters. My favorites were Girl of the Limberlost, Prudence of the Parsonage and a companion volume, maybe Prudence Gets Married? About a family of girls and their widowed father, a Methodist minister, set about the same era as Girl of the Limberlost. I notice nobody listed Laura Ingalls Wilder or Betty MacDonald's books for adults--The Egg and I, Anybody Can Do Anything, etc. Rumer Godden's books, including China Court, are wonderful. Another terrific writer: Nevil Shute, who did indeed write (many) more books than On The Beach and A Town Like Alice. I'm stopping now but like others, I could go on much longer.